By Michael Bourne The book Canadians are snapping up hardly paints them in a flattering light. King’s tone is breezy and light, full of funny stories and self-deprecating jokes, but just below that geniality lies a deep reservoir of bitterness over the treatment of Indians in Canada and the United States that continues on to this day. White North Americans, he argues, prefer their Indians noble, primitive, and safely extinct, and actual, live Indians who stubbornly insist on their rights as an independent people they regard as at best a troublesome nuisance. On its face, the wildly different response to King’s book—breakout bestseller in Canada, quiet academic publication in the US—is puzzling. True to its subtitle, The Inconvenient Indian gives equal attention to the relations between whites and Native peoples all across North America; indeed, one of King’s points is that the border between the US and Canada has little cultural meaning for Native people, many of whose tribal lands spanned the present-day border long before either country existed. And though King, who is now 70, has lived in Canada since 1980, he was born and raised in California and maintains dual US and Canadian citizenship. The curious publication history of The Inconvenient Indian serves as a window into the wide differences in the way mainstream Americans and Canadians view the Native peoples in their midst. For one thing, the average white Canadian is more than twice as likely to run into an Indian than a white American is. The 2010 US census identified roughly 5.2 million Americans with Native heritage, or about 1.7 percent of the total, whereas Canada’s 2011 census identified 1.4 million people of Native ancestry, comprising about 4.3 percent of the Canadian population. Such abundance of Native likenesses is no accident. Nearly absent from debate about mascots is the fact that Indian nations were colonized by the United States, leading not only to relationships of disparate power, but also to the fascination with the natives common to all colonial projects and the desire of the colonizer to maintain control of the historical and contemporary narratives of their encounter. Indian mascots aren’t fun-loving objects of admiration or a mere articulation of innocent fandom. Nor are they a legitimate attempt to “honor” Natives (a deed best accomplished, in any case, by listening to them rather than informing them what type of altruism they should accept—or, better yet, by supporting the implementation of treaty rights). Fans can absolutely root for Indian mascots without malice, but there is no escaping the fact that on a broader level those mascots are remnants of a colonial need to name, govern and define. It is pointless to reduce the issue to individual intent when the problem is institutional. 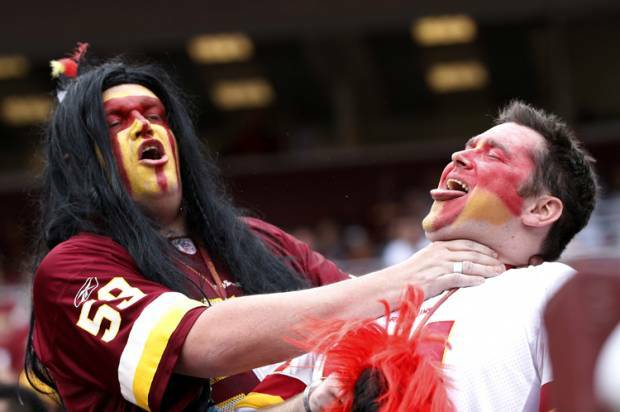 If we are fully to make sense of the Redskins controversy, then, we need to remove the conversation from conventional sites of multicultural politics and situate it in analysis of colonialism and its enduring legacies. Whenever I teach Native literature, the subject of mascots arises. Most Americans encounter Native politics through the issue. It is unfortunate, because greater questions exist about sovereignty, self-determination, resource appropriation, repatriation and decolonization. It is therefore doubly unfortunate that discussion of mascots is usually delinked from those greater questions. When my students invoke mascots, I try to offer a perspective wider than matters of representation and sports culture. Many are comfortable debating racism (especially those who believe it doesn’t exist), but most have no ability to question the legitimacy of the United States as a steward of indigenous territories.Comment: The notion that Indian issues--sovereignty, treaty rights, etc.--are over and done with is central to debates about racism and stereotyping. Americans steeped in white privilege--including minorities who want to fit in--don't want to discuss their own crimes and misdemeanors. They don't want to revisit the mistakes they or their ancestors made. The ideology of American exceptionalism demands that we be perfect, godlike, unassailable. We think of ourselves as God's chosen people, and use this religious dogma to justify our actions. Nothing can challenge this--not even changing an Indian mascot--or the whole house of cards may come down. In short, questions about one aspect of our mythology--that we love and respect our domesticated Indians--leads to other questions. And the white-dominated mainstream culture can't allow that. So it tries to shut down mascot debates with lines such as "You lost" and "Get over it." These comments make their not-so-subtle agenda almost clear. "We want our mascot" means "We want our comfortable myths about taming America and bringing civilization to the savages." Changing the mascot means "You're reminding us that our country was founded on genocide and that upsets us. Stop making us feel bad with the truths we've tried to bury." Below: A metaphor for what the mainstream white culture fears: that blacks (welfare, guns), Latinos (immigration), Muslims (terrorism), gays (gay marriage), and Indians (mascots) will rise up and take over the country.